New Forest hotels are particularly popular amongst those who seek that extra bit of luxury when away from home, and are widely available throughout the National Park. Guests seeking New Forest hotels will find an impressive choice available in Lyndhurst and Brockenhurst, and will also find a range of others in many of the smaller villages and outlying areas. Hotels on readily accessible, main through routes or in village centre locations appeal to many visitors, whilst those who prefer quieter parts of the New Forest will not be disappointed, either. New Forest hotels cater well for general visitors (and often welcome walkers), whilst business visitors are also assured of a pleasant stay. Often located in buildings of immense character and historic interest, many hotels also enjoy access to their own landscaped grounds, whilst some also offer impressive leisure facilities, such as a pool and fitness suite, and many boast a first class restaurant. Costs usually reflects the extent and standard of facilities provided, although there is inevitably a certain amount of commonality between each. Good advice, then, particularly if cost is a significant factor when choosing, is to undertake at least a little research before booking. 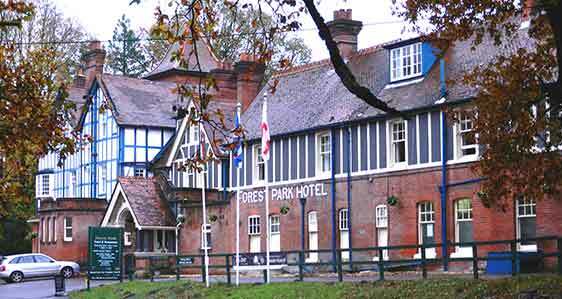 New Forest hotels offer a warm welcome and friendly, professional service. Indeed, many are so popular that some visitors return year-after-year. Remember, though, that it is often advisable to book in advance, particularly during the busy, summer months.